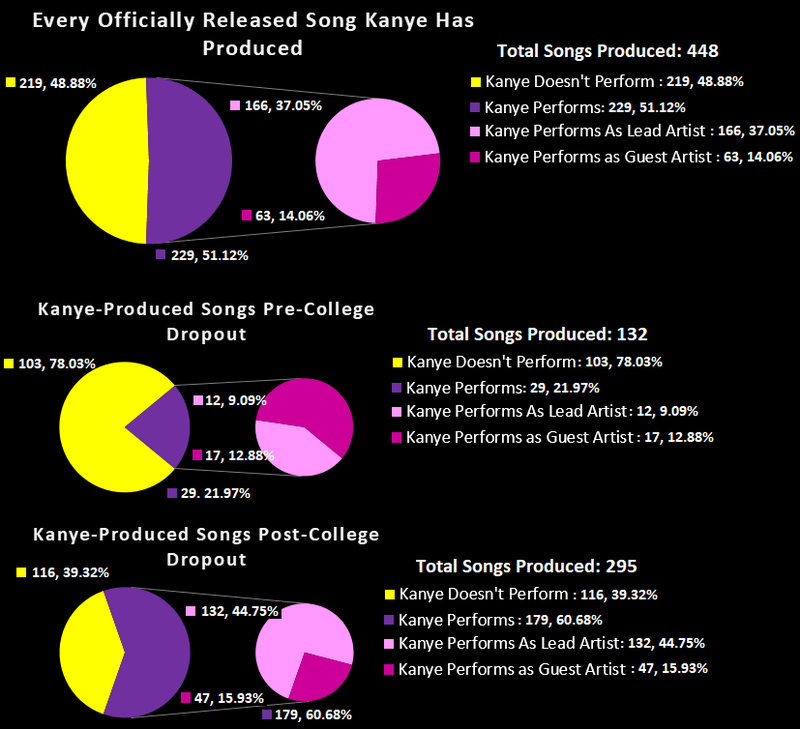 Ben's Big Blog: By The Numbers: How Often Does Kanye West Perform On His Own Beats? When Kanye West began shopping beats to artists with major label backing, he was at times thought of as a cut price Just-Blaze, and stories have since circulated of Ye being laughed out of studios after playing tracks like "Jesus Walks" for potential labels and collaborators. This didn't appear to dampen his desire or belief, and Jay-Z told The Breakfast Club in 2013 that Kanye played some music for Jay well before "Through The Wire" (2002) and proclaimed "I am the saviour of Chicago", to which Jay replied "What you even talking about? You ain't even have a single". Kanye knew his own potential well before anyone else. John Monopoly told MTV in 2005 that Kanye had been keeping a lot of his beats for his own solo project, even when in high demand as a producer post-Blueprint in 2001. It was 2011 when he rapped "And I'm rapping on the beats they supposed to buy / So I guess I'm getting high off my own supply", but as the numbers show, Kanye had no intention of being a producer who rapped. He was always a rapper who produces. Of the 448 officially released tracks that Kanye has produced, he's performed (either a hook or a verse) on 229 of them, which is just over half. 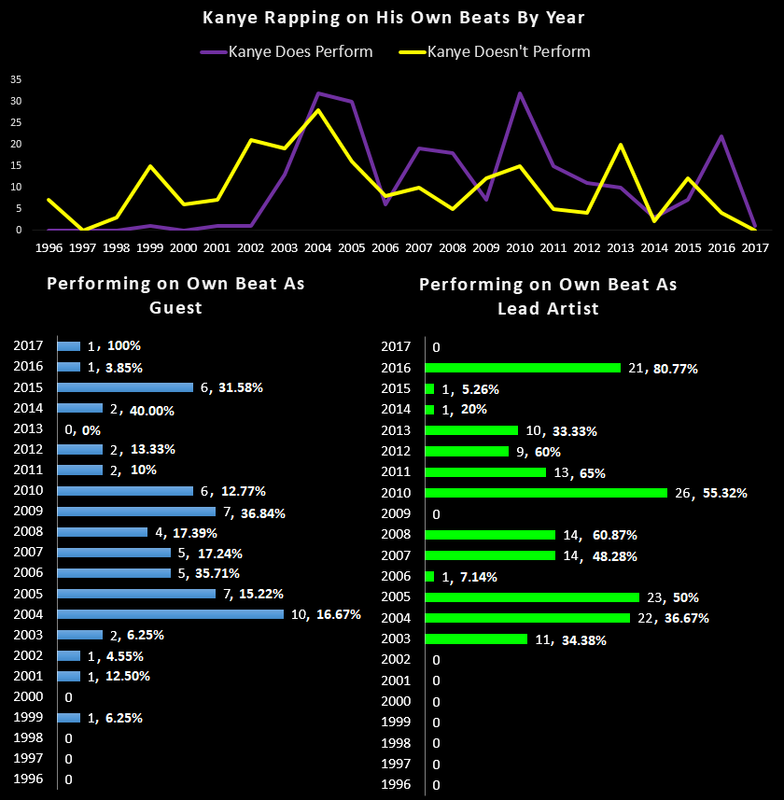 37%, or 166, he has performed as the lead artist, and surprisingly, just 14% of the tracks Ye has produced have him listed as a guest artist. Kanye's vision of his rap career was evidently not shared by his customers prior to 2004's The College Dropout. Before that record, Kanye produced 132 songs that were officially released. He performed on just 29, and only 12 the lead artist. Those 12 tracks almost all came from his mixtapes I'm Good and Get Well Soon. As a guest artist, 12.88% of the beats he sold ended up featuring on, but they weren't consistent features. He picked up a verse on "The Bounce" by Jay-Z, but when he performed twice on Jay's final record The Black Album, on "Encore" and "Lucifer", he was only credited for his vocals on "Encore", and his performance on 2001's "Never Change" from Jay's The Blueprint features an entirely uncredited performance. Even being a fully-fledged member of the Roc-A-Fella team didn't afford him a lot of in-house opportunities. The hip-hop world seemed to catch on to how valuable Kanye was as a performer after his debut record. Of the 295 songs he's produced since the album that have been officially released, he's performed on over 60% of them, with 132 tracks (44.75%) as the lead artist. It feels like a let-down when a beat is produced by Ye but doesn't feature him rapping or providing a hook. Kanye's output as a rapper slash producer has varied wildly over the years. His earliest forays into paid production came via Grav's 1996 album Down To Earth, a project that also featured production from Kanye's mentor No I.D. While it may appear that this placement didn't launch his mainstream career as a producer, based on his numbers in 1997 and 1998, rumours exist placing Kanye as a ghost-producer for Deric "D-Dot" Angelettie, a legendary producer pivotal in Kanye's early career advancement. Whether these rumours are true or not, Kanye didn't stop working over this period, and it was through D-Dot that he picked up 6 credits on The Madd Rapper's 1999 album Tell Em Why U Madd. From there came Jay-Z's The Dynasty in 2000, and Ye was on. Initially, these high-ranking beat placements didn't assist his push to be heard as a rapper. While music does exist from Kanye's group The Go-Getters from this pre-2000 period, the tracks weren't officially released, and only appeared on unofficial compilations and via a full album leak sometime around 2010. Kanye's guest spot on "What You Do To Me" by Infamous Syndicate in 1999 saw him spit one of his very first commercial verses. As the graphs above show, it didn't really open doors. Kanye had to bang those doors down. In 2003 he began rapping as the lead artist on some of his beats. 34.38% of the songs he produced that year featured him as the lead artist, thanks to the mixtape I'm Good. It was the precursor to The College Dropout, and once that album scaled the heights it did, Ye could set his own price, and a feature verse or hook from Kanye became invaluable. 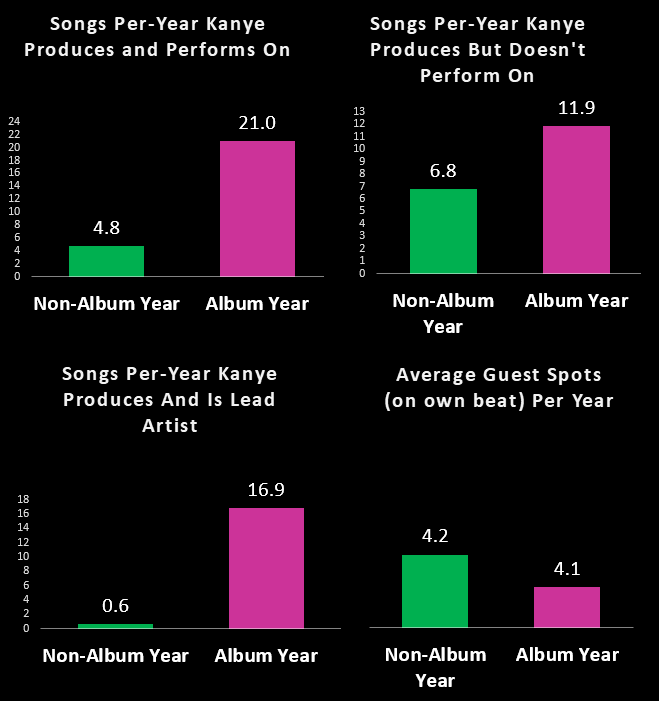 Unsurprisingly, when Kanye releases an album his production output increases dramatically. It follows a pattern whereby Kanye seems to lock down for a project in the year prior, gathering beats and perfecting the record before releasing it. Certain years have been very barren for him. In 2017 he had just one major production credit, and in 2014, post-Yeezus, he had just 5. His output since he became heavily invested in the fashion industry has slowed dramatically, outside of years he actually releases a project. Some of these numbers are mind-boggling. During non-album years (2006, 2009, 2014, 2015, 2017) Kanye releases, on average, 0.6 songs that he both produces and features as the lead artist on. Examples include "All Day" and "Only One" from 2015, and "Impossible" from 2006. His hibernation during non-album years doesn't extend to guest spots. He actually performs more on songs he sells to other artists during non-album years than he does when he releases a project. Yet he also sells more beats that he doesn't perform on himself during album years. This could be due to the large build up of production work he accumulates during the recording process for an album. Those beats have to go somewhere. There is a legendary scene in Jay-Z's Fade to Black, in which Jay is seen in the studio with producer Timbaland listening to beats. Timbo plays Jay a selection of beats, and Jay eventually chooses what will become "Dirt Off Your Shoulder", but in subsequent years other artists have released tracks over the instrumentals that Jay rejected, notably "The Potion" by Ludacris and "Come As You Are" by Brandy. Good beats don't just sit on the cutting room floor, but stories from Kanye's pre-College Dropout days might confirm Kanye only sells beats either to his own artists via the G.O.O.D. Music label, or beats that he doesn't see himself performing on in the future. What Do These Figures Mean for 2018? Kanye's pattern of production in album mode suggests he is locked down right now, working on multiple projects. CyHi The Prynce claimed in November 2017 Kanye was making "...like 10 beats a day", with full projects on the way from CyHi himself, Teyana Taylor, Pusha-T, and Kanye. Ye has had one production credit thus far in 2018, on Migos' Culture II, but his recent silence may indicate 2018 will be flooded with Kanye product. Note: Only beats that were officially released are included in this analysis. Kanye's first two mixtapes were released by him, but leaks that aren't official are not included. There is also an uncredited hook on "Guess Who's Back" by Scarface which isn't included in the above graphics. If you find any other uncredited Kanye performances please email me so I can add them to the list and re-work the graphics!